Welcome to Emerson Primary Care Associates of Bedford. Our board-certified physicians and excellent staff are equipped to provide you with high-quality health care—conveniently, right in your community. We are invested in caring for the best possible care for our patients and are available to provide a wide range of preventive services. Our skilled primary care physicians provide state-of-the-art care onsite or will partner with outstanding specialists with whom we work closely. Our physicians emphasize prevention, with a focus on diet, exercise and stress reduction. We listen to our patients with the goal of treating the whole person. We also have additional expertise in geriatrics, vascular medicine and nephrology (care of kidney disease). In addition to the physicians, our staff includes a highly experienced nurse practitioner, behavioral health specialists and a phlebotomist who takes blood samples. The practice has a small onsite lab. As our patients know, we spend time with them and are committed to addressing their concerns. Please call our office at 339-215-5100 to make an appointment. The office is open 8:00 am-5:00 pm, Monday through Friday. If you are having a medical emergency, dial 911 or go to the nearest emergency department. For the convenience of our patients—and all patients who live in the area—we have a lab onsite staffed by a phlebotomist who draws blood samples. They are sent to the main lab at Emerson Hospital for analysis. Dr. Hanjura is board-certified in internal medicine and has clinical interests in high blood pressure, diabetes, women’s health and geriatrics. She graduated from University of Pittsburgh School of Medicine and completed her residency at Case Western Reserve University Hospitals of Cleveland, where she also completed a geriatrics fellowship. 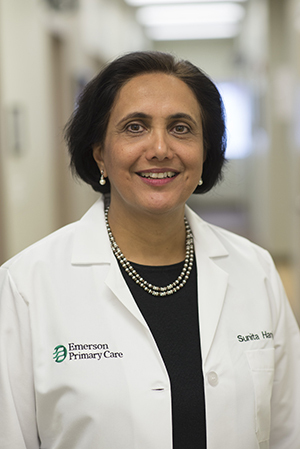 Dr. Hanjura has been on the Emerson Hospital medical staff since 2004. Prior to that, she was in practice in Rockville, Maryland. Dr. Hanjura has served as vice president of the Emerson Independent Physician Association Board and currently is on the board at New England Deaconess Abundant Life in Concord. She lives with her family in Lexington. Dr. Lynch is board-certified in both internal medicine and nephrology and has clinical interests in general internal medicine and kidney disease. She earned her medical degree from the University of Pennsylvania School of Medicine and her masters degree in epidemiology from the Harvard T.H. Chan School of Public Health. 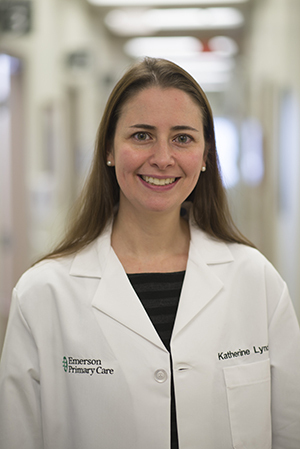 Dr. Lynch completed her residency in internal medicine and a fellowship in nephrology at Beth Israel Deaconess Medical Center. Dr. Lynch joined the Emerson Hospital medical staff in 2017. In caring for her patients, she has an appreciation for the mind-body connection and its impact on health. 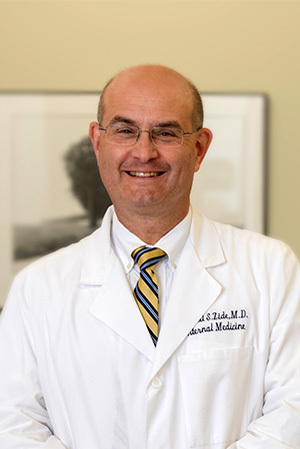 Dr. Zide is board-certified in internal medicine and vascular medicine and has clinical interests in cardiovascular disease prevention, deep venous thrombosis, peripheral vascular disease, anticoagulation, hypertension, dyslipidemia and other diseases of the arteries and veins. He earned his medical degree from Boston University School of Medicine and his master’s degree in art from Boston University Graduate School of Arts and Sciences. Dr. Zide completed his residency in internal medicine at Lahey Clinic. 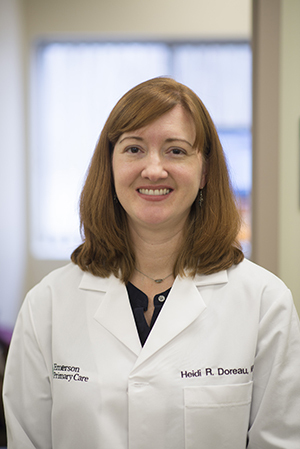 Ms. Doreau is certified as an adult nurse practitioner and gerontological nurse practitioner. She also is certified as a clinical densitometrist, which allows her to interpret bone-density scans and counsel patients. She received her master of science in nursing from MGH Institute of Health Professions and currently is pursuing a doctor of nursing degree from University of Massachusetts-Amherst. Ms. Doreau has been with the practice for five years and currently also works at Rivercrest Wellness & Rehab and Newbury Court in Concord, a continuing care retirement community. At Emerson Primary Care Associates of Bedford, we accept most major health insurance plans, including the following.